The 3 layers of earth are the core, mantle, and then crust. Their each important because helps us about gravity. The crust is important because is where we live. The Mantle is important because it makes up most of earth, it helps out with gravity. Lastly, the last one, the core is important because its in the very center of earth. The continental drift is when all the continents were all together once. But throughout time, that one piece of land. Turned into 7 continents. The person who came up with this theory is a German meteorologist named Alfred wegner in 1910. The two main ressons why scientists belive in this theory is because , there is fossils that look the same in different continents, and mostly because if you look at the map of the world, It looks like a jigsaw puzzle. Seafloor spreading is when underwater and spreads apart and magma creates new floor. The person that came up with this theory was a man named Harry Hess. He noticed something in the ocean. That’s how he discovered it. This helps the scientist explain continental drift . Because the tectonic plates move. The theory of plate tectonics is that people think that the earth is split in plates. There are 3 types of plates, transform, divergent, convergent, and convergent with subduction. Means when two plate split away or that DIVES away from on another this can happen in land and in oceans. Examples for in oceans earthquakes, volcanoes, but mainly seafloor spreading. For land can also be earthquakes, volcanoes, but instead of seafloor spreading it can also cause rift valleys. 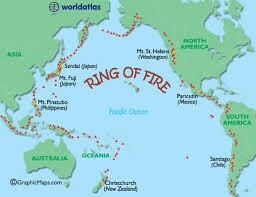 This is why the ring of fire is formed because of this divergent. 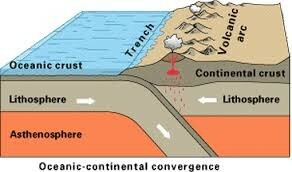 It is when 1 plate tectonic goes on top of another. Examples of this can be trenches or volcanoes.